THE INTERACTIVE MATH FULL YEAR CURRICULUM SOFTWARE CD In addition to all the great contents and features of Standard Edition, the Premium Edition includes the following valuable and time savings features. 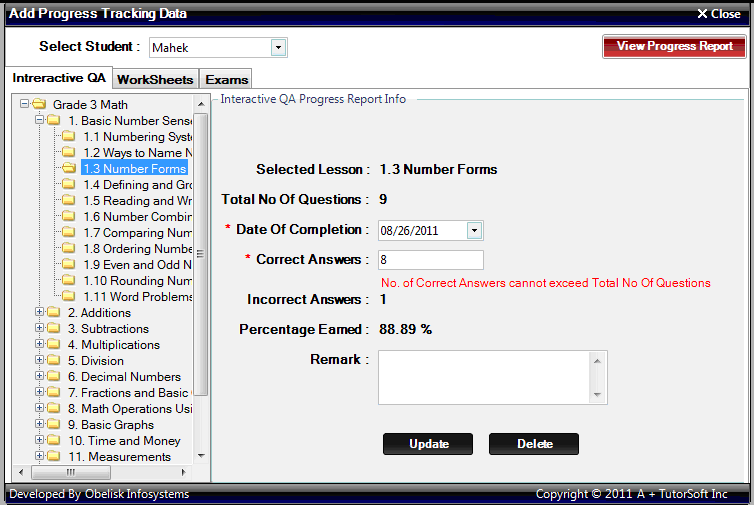 Parents can keep a record of student's scores for every interactive lesson, worksheet and exam for up to 5 students. Allows parents to hide the "answer keys" and "solution guides" from a student and make it available once student has completed the assignment and needs to review the work with step-by-step solution guide. Parents can select each student and hide/unhide the "answer keys" and "solution guides" for the selected student or all students. This gives better control to parents to ensure the student is able to work on problems on Worksheets and Exams without any assistance and allow them to check their work once it's completed to identify the areas of strengths and weaknesses. 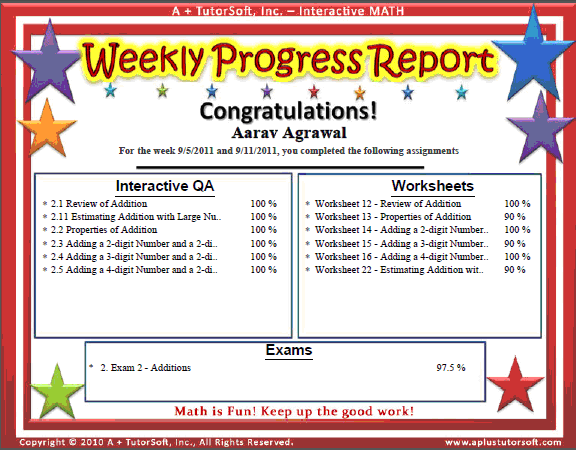 The system tracks all assignments completed by students once parents have entered their assignments scores and generates a "Weekly Progress Report" in a very child-friendly format for child's review. This provides encouragement to your students as they see their weekly accomplishments in a very well formatted "certificate-like" format. 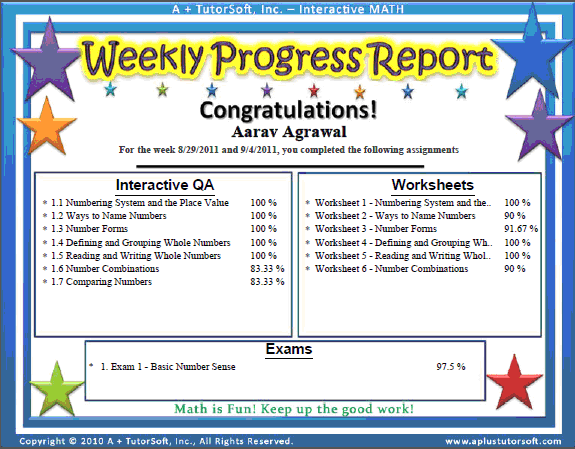 Students feel good as they are reminded by our MATH software system of their great work and accomplishments. 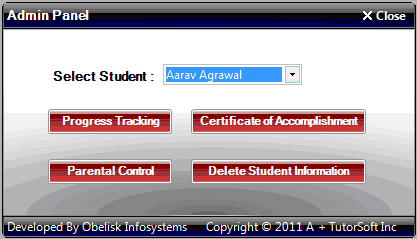 Students can print and keep copy of the weekly certificate for their record or go back and look at any previous week's "Weekly Progress Report" in an electronic format on their computer screen. 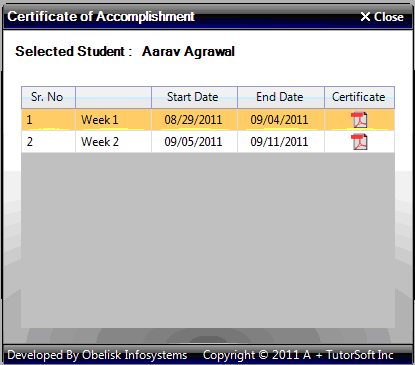 Certificate of Accomplishments "Weekly Log"
Certificate of Accomplishments "Weekly Progress Report"
Copyright © 2012-2018 A + TutorSoft Inc., All Rights Reserved.